From Templepatrick to the Airport Roundabout: Take the A26 for 500 metres and turn right at Killead sign post. Follow road for 1 mile and Killead Airlodge is on the right. From Nutts Corner Roundabout: Take A26 Tully Road for 2 miles and follow the signs for Killead. Turn left at the junction and follow Killead Rd for 0.5 of a mile. 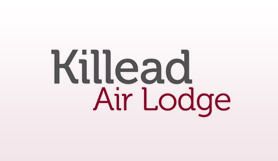 Killead Airlodge is on the right hand side. On arrival report to reception and present your confirmation or quote your booking reference number. You will be required to leave your keys with the car park as your car will be parked for you. Please note that all customers will be charged a £2 per car fee on arrival at the car park. This is to cover Airport Authority fees. Full departure instructions for your return will be issued on your arrival at the car park. Transfers to the airport run 24 hours a day on demand and take only 5 mins.